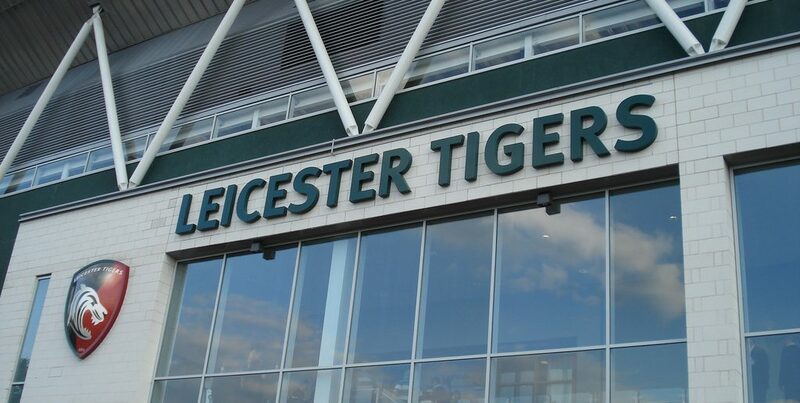 The FRU chats to Alex Blackwell, a Leicester Tigers season ticket holder for 15 years, to gain an opposition perspective on Ulster, what’s gone wrong at Tigers and what there is to do in Leicester after the match. Out of the running for European progression before the January fixtures and in lowly seventh in the Guinness Premiership, what has happened at Leicester this season? A disaster. The defence has been the big problem – we averaged four tries conceded per game for the first ten matches – as well as consistency. We’ve seemed to have turned a corner in the last few games against Harlequins and Gloucester, however we took a step back against Scarlets last weekend. We picked up ten points in both those games [v Quins & Gloucester] as well as a tough away loss against Bath. We signed a new defence coach, Phil Blake, and he seems to have made an instant impact after joining at the end of December. Our attack seems to be causing all sorts of problems chiefly led by George Ford and our wingers, Jonny May and Wales international Jonah Holmes. Only two English sides are in the mix to qualify for the next round of Europe and the PRO14 currently leads 8-4 in wins over Gallagher Premiership sides. Why have the Premiership sides had a disappointing return in Europe this season? I think currently the top PRO14 sides are probably slightly better than the Premiership sides, excluding Saracens and Exeter, but I don’t think there’s any huge reason for it. I think it goes in cycles. It was only a few seasons ago that there were no PRO14 teams in the quarters so I think there’s a lot of overreaction regarding how ’bad’ the English teams are and how particular aspects such as relegation and salary caps need changing. I think it will sort itself and for English teams, the goal of trying to get every team to compete in England shouldn’t sacrifice what is a fantastic league structure. One Ulster player you’d love at Tigers. Iain Henderson. He’s a top player and is a great ball carrier, effective in the lineout and has a great work rate as well as being a real leader which is something that Leicester lack in the heart of our pack. We’ve been crying out for a top quality second row since the days of Ben Kay and Martin Johnson. The thought of Jacob Stockdale and Jonny May on our wings would also be frightening while Marcell Coetzee would be a good addition to our back row. Ulster player(s) that you’re most worried about? Michael Lowry. In the reverse fixture he showed real promise and great footwork against us. With our defence only just turning the corner and if we kick poorly he could cause us all kinds of problems. Jacob Stockdale is also a big threat having scored six tries in five Champions Cup appearances this season as well as John Cooney. Matt Toomua. The Australian playmaker is in his last season with us before he joins the Melbourne Rebels but he does not get many opportunities for us at out half. Expect him to offer control from 10 as well as a great passing game and a good eye for a gap. Jordan Olowofela is a talented young winger that played in the U20 World Championship last year. He’s got great pace and is improving with every game he features in. Other players to look out for are young flanker Will Evans who is a real menace at the breakdown and a young prop Joe Heyes who could be a future England star. How do see the rest of the season going for Tigers? Cautiously optimistic. We’ve 11 games left in the league and realistically need to win eight to get top four. We had success in most of the remaining fixtures last year and we seem to be hitting some form under Geordan Murphy. Although with the league as tight as it is we could finish 9th as easily as 3rd. A top six finish would be a good result for Murphy’s first season in charge considering the start we had. 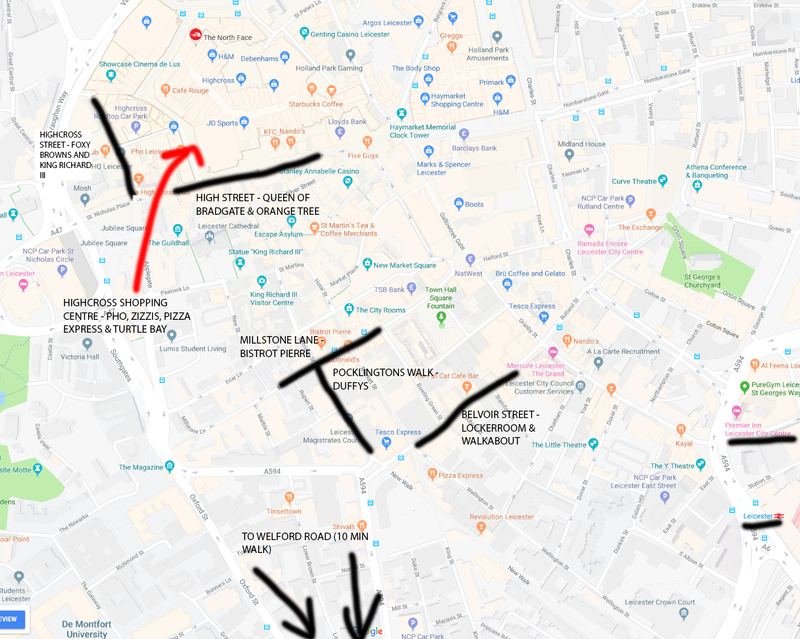 Places of interest in Leicester for Ulster supporters? Most of the pubs and restaurants are located on High Street and Belvoir Street. For restaurants there’s the typical chain restaurants such as Zizzi’s and Pizza Express located in the square outside Highcross shopping centre. In that same area for something different Turtle Bay or Pho offer Caribbean and Vietnamese food respectively. I’d recommend Bistrot Pierre which is located on Millstone Lane. It offers French cuisine to the highest standard but you may have to book in advance. King Richard III, on Highcross Street is a good spot to go for a few drinks and isn’t too expensive while Foxy Brown’s tailors to a younger audience and is on the same street. It has reasonably priced cocktails and is locally run business. Any of the bars on High Street offer a great atmosphere and reasonably priced drinks. The Orange Tree has a nice beer garden with heated lamps and offers a good range of cocktails and spirits as well as craft beers. Queen of Bradgate does a wonderful Sunday roast but expect cocktails, craft beers, live music and a gin bar on Friday and Saturday nights. To watch the other matches that weekend, I’d recommend Duffy’s Irish bar on Pocklington’s Walk as it has BT Sport. Other than that Lockerroom and Walkabout (both on Belvoir Street) are sports bars but are likely to prioritise football over rugby. After the match, if you’re after a rugby atmosphere head to The Final Whistle bar in the Holland and Barrett Stand at the stadium. They’ve a live band called Rock Bottom that plays after every match but expect rugby prices.